Anxiety is classified as a feeling of worry, nervousness or unease about something with an uncertain outcome. People who feel these symptoms regularly may be suffering from Generalised anxiety disorder or 'GAD'. Living a normal lifestyle when suffering from anxiety can become difficult due to the high levels of stress that can be triggered by everyday activities. It's common to be prescribed antidepressants when suffering from anxiety, however, this is not always the best form of treatment as many have side effects similar or worse in nature than the initial condition that they were supposed to be treating. Magnesium helps us in a multitude of different ways ranging from the ability to relax muscles throughout the body to the unique way it helps to re-mineralise teeth. 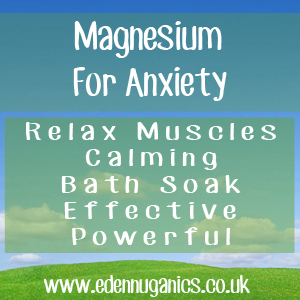 One of the most popular uses of Magnesium is as a natural treatment for anxiety. A French study of 264 patients suffering from GAD found that a statistically significant number of men and women reported improvements on a Magnesium regimen. Another study found that Magnesium may have a positive effect on depression as well. Both depression and anxiety are often linked, because both result in fatigue. This is one of the most popular methods of including Magnesium into your daily routine is by adding it to bath water before a soak. Magnesium Chloride is easily absorbed by our body's through the skin (transdermal) and is known to have an extremely relaxing and calming effect. This first thing we need to do is run a hot bath. Next, add around a cup full of Magnesium chloride flakes to the water. Wait around 5 minutes, this allows time for the Magnesium flakes to fully dissolve into the water. Now it's time to get in and soak, try and remain in the bath for a minimum of 15 minutes. After you get out the tub your whole body should feel relaxed and calm, this treatment can be repeated daily as a great way to unwind after a hard day. Magnesium plays an important role in more than 300 chemical reactions that keep the body working properly, so making sure we have a steady supply is essential. Supplements are a great way of topping up your daily magnesium levels and will help to keep anxiety and stress to a minimum. Magnesium, the easiest cure for Anxiety? Chamomile - Chamomile can be made into a great is a great natural tea that can be used in the treatment of anxiety. The calming effect of this daisy like plant has been known about for centuries with records of use dating back as far as the Ancient Egyptians. Lemon balm - Lemon balm is a perennial herb native to the Mediterranean and Asia, this powerful medicinal herb has been used as a remedy for anxiety for hundreds of years. Passion flower - Passion flower also known as 'Passiflora incarnata' is a plant with a vast array of medicinal properties. One of the most popular uses for passion flower is as a treatment. Some evidence suggests that the flavonoids 'Chrysin' and 'Benzoflavone' may be the primary flavonoids in passion flower that are responsible for decreasing anxiety. Omega-3s - Omega-3 fatty acids are also known to be beneficial to those suffering from anxiety and can be used in combination with herbal supplements to increase effectiveness. Some of the best natural sources of omega-3s include oily fish and nuts. Anxiety - what is it and why do we get it?